Villa Jewel is a private villa with 6 bedrooms and 6 bathrooms built of famous Brac white stone and completely refurbished in 2015 to a very high luxury standard. Villa Jewel benefits from its location in an extremely quiet and peaceful bay, but only minutes away from the local villages. Villa Jewel is fully staffed with housekeepers and private concierge so the guests can relax and enjoy their vacation to the fullest. It is surrounded by a lush garden with lavender, pines, rosemary and many other authentic Mediterranean plants with magical scents. The main, fully equipped kitchen is in this area as well as dining area and spacious living room. The living area exits to a covered terrace with al fresco dining table. Beautiful terraces offer plenty of space for unlimited relaxation and privacy. One of the terraces features a Jacuzzi and the other a hammock. The main terrace offers a heated infinity swimming pool, day beds and loungers for sunbathing and enjoying your vacation like a true hedonist. From this terrace, a path leads to the private beach and the crystal clear sea. There is a buoy available for the boat. 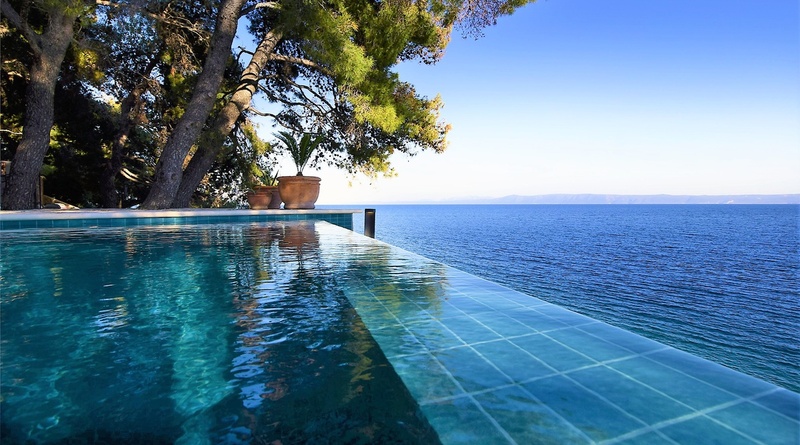 Villa Jewel is definitely a perfect oasis for an unforgettable villa vacation in Croatia. It can accommodate 14 guests comfortably and offers a private parking, 2 brand new bikes, 2 kayaks, board games and table tennis.